So, here we are. The big phones of 2013 (well, the first half of it at least – we've still got the iPhone 5S / iPhone 6 to land at some point) have all landed and you're probably wondering which is best. 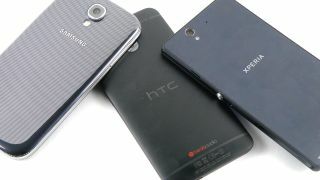 Well, it's not as easy as usual, as we have three stand-out contenders for the throne of best smartphone. Luckily for you fancy people we've spent weeks with all three and have put together this in-depth test to show where the HTC One, Samsung Galaxy S4 and Sony Xperia Z have strength and weakness. So, onto the battle… it's not going to be pretty, but at the end you'll be able to know which is the best smartphone on the market right now as it comes stumbling through the smoke and into the daylight. Having killed the other two, in case that wasn't clear. Design-wise, there's a big disparity between all three devices on show here, as each has a different take on how the smartphone should look. The Samsung Galaxy S4 is using a similar construction to its predecessor, which may be polycarbonate but looks and feels rather cheap in the hand. It weighs practically nothing, which is a real plus point, but there's no doubting that it doesn't justify the cash in overall feel. It does have one design win though: while maintaining the same footprint as the S3, the Galaxy S4 now has a 5-inch screen that pushes much closer to the edge of the handset, which gives a much more immersive feel. That said, the Sony Xperia Z is really struggling to show it's worth the cash as well, with a very plastic shell and one that sounds really cheap when tapped on the back - it's got a very hollow ring to it and doesn't scream that you've bought a phone worth the best part of £500. However there's a fairly good reason for the cheap-feeling design: the Xperia Z is both waterproof and dustproof, with seals around each port to stop water and other nasty stuff affecting the use of your new smartphone. The most impressive on test is the HTC One, with its full aluminium shell. It's something of a masterpiece in terms of design, with it feeling more like a sculpture than a smartphone. It also took years of work to understand how to make something out of aluminium to this degree while still letting you make calls and stuff. Sure, aluminium isn't as durable as plastic, but hold all three in your hand and we challenge you not to fall a little in love with the HTC One. The Sony Xperia Z and the HTC One both share a common operating system in the shape of Android 4.1. It's an excellent OS, but one that's bettered by the Galaxy S4's Android 4.2 offering. Both are called Jelly Bean, but the latter does come with a larger amount of bells and whistles. But we're not talking about the features here - it's how easy each phone is to use. From that perspective the Samsung Galaxy S4 is in third place. That's not to criticise it too much, as it's an excellent OS and one that really rewards the user the more you dig into it. But if you're after an operating system that allows you to pick it up and just get to grips with all the functionality, the other two are streets ahead. The Sony Xperia Z isn't too far removed from core Android, and by that we mean the layout and extra features are both pretty simplistic, sticking relatively close to what Google wanted when it created the OS. And when things get more technical, the phone is fluid and intuitive, automatically giving you information on your music and movies from the web which creates a really nice effect.